Great Books to Read in the Library Catalog! Check out these award winning and honor books to read in the library's catalog! Annually awarded to the most distinguished American picture book for children. Annually awarded to African American authors and illustrators for outstanding titles that promote understanding and appreciation of all cultures. Annually awarded to the most distinguished contribution to American literature for children. "Having a hard time deciding? Click here to listen to descriptions of Newbery Award Winners, courtesy of the University of Tennessee." Awarded annually to the most distinguished informational book. Awarded annually to a picture book or short non-fiction book that authentically portrays the Jewish experience. Awarded annually to a novel or longer non-fiction book that authentically portrays the Jewish experience. Recommended Book Lists from the ALA's Association for Library Service to Children. *Click on any of the links on this page to see a list of the titles in The Library's Catalog. *Select the book you want and place a request on it. 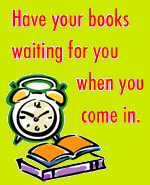 *The Library staff will pull the books and have them waiting for you at the check-out desk when you come in.